Mark’s story… | Cartref Ni - My Home. My Life. My Choice. 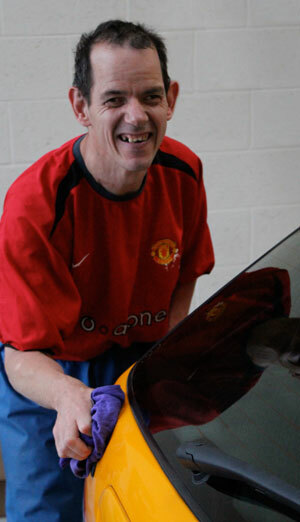 Mark enjoys his job of cleaning cars at a local garage. Cartref Ni service user Mark comes from Denbigh, but has lived in Ruthin for several years. Mark leads a very busy life – a typical week includes attending Denbigh College, swimming, Pedal Power, library visits and the Denbigh Gateway Club. He recently achieved his ambition to walk up his local mountain Moel Famau, raising a fantastic £300 for charity. Despite Mark’s physical limitations, he was determined to make the walk happen. He was supported to practice walking on different terrains and gradients to help build his fitness. Due to Mark’s disability, he is not very stable walking down hill, but his support staff made contact with the Loggerheads rangers, who kindly agreed to pick Mark up from the top and bring him down safely. Mark walked up Moel Famau in 1 hour 20 minutes. Once at the top he celebrated with a glass of champagne and was pleased with his “new record”.